My experiences as a teacher from a minority culture pushed me to become an activist in my school. The result has been a change in our school culture and an improved learning environment for our students. Here’s how this change happened. I have always wondered about how diversity affects learning and to what extent our curriculum supports diversity. Does our education system prepare students to embrace diversity and take pride in their own heritage? As teachers we are driven by curriculum expectations. It is easy to lose sight of how students’ classroom experiences will shape them as members of society and of how to make learning more meaningful in the long term. Growing up in the metropolitan city of New Delhi, India, I was always aware of diversity, as people from my native country’s various provinces represent a variety of cultures, religions, and races. My perspective however, was that of a member of a majority cultural group. After I immigrated to Canada, diversity took on a different meaning for me. I was no longer part of the majority culture and became more aware of my race and ethnicity. In 1999, as a new classroom teacher, I attended several workshops focusing on teaching ESL students where I was often one of the few visible minority teachers. During both the formal and informal discussions, I heard new immigrant families referred to as “basement people” and their clothing called “costumes.” I also heard comments like “Immigrant families should be forced to learn English”; “They all come to Ontario just to beneﬁt from the welfare system”; and “English is a much more advanced language than their heritage language and that’s why they have difﬁculty learning it.” It wasn’t long before I realized that I had to take a proactive approach to deal with various “isms” I was encountering. My students were a diverse group. Research suggests that students who see themselves reﬂected in the curriculum are more engaged in their learning1. But I found a big gap between my students’ cultures and those depicted in the teaching resources and picture books in my classroom. Providing students with authentic experiences from various cultures allows them to take pride in their own heritage and to better understand other cultures. A safe environment where they can express their ideas freely enhances their chances to be successful in various subject areas. I will never forget the ﬁrst time I wore a sari to school for the Hindu festival of Diwali and brought sweets, artifacts, and storybooks to share with my students and colleagues. My students, irrespective of their own cultural background, were excited and interested. In the following weeks several wore their own cultural dress with much pride. I began purchasing books and other mate- rials that dealt with equity issues. My colleagues and I, with the help of our vice-principal, formed an equity committee. We surveyed students, staff, and parents to determine the needs of our school community. We learned that there was a need for more information to be translated for immigrant parents. 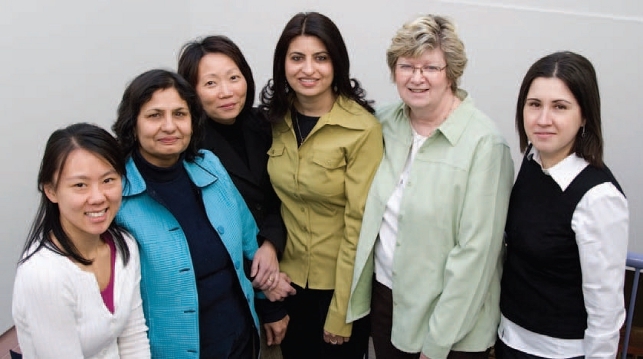 Many asked for more information on government services for newcomer families. Our teacher survey suggested we needed resources and materials to provide for more inclusive education. One result of our work was that the public health nurse at our school, with the help of translators, delivered workshops to help recently arrived families access services in the community. In the meantime I began looking for training to help me deal more effectively with responses like “Sounds good but I don’t have time to cover equity” or “Look at our school population, we already are so multicultural and we don’t need to worry about equity” or “I can’t read a book that deals with homophobia, especially in our conservative school community.” I attended a conference for racialized and marginalized groups offered by ETFO’s Equity and Women’s Services where we discussed the concerns we faced in our schools. Despite our different backgrounds, we faced similar equity issues and we all felt the need to address these strategically. We also learned about opportunities for involvement and leadership in ETFO. A few months later I was accepted into ETFO’s Leaders for Tomorrow program. This program had a profound impact on me personally and professionally. I had the opportunity to work with other ETFO members, develop strategies, and grow as a leader. Participation in various workshops enabled me to polish my leadership and public speaking skills. I learned how to approach equity issues strategically and to handle difﬁcult situations more effectively. I learned to persevere and appreciate small gains. The progress that the other participants reported having made at their schools made me more determined to continue working for more inclusive education. After completing the program, I took part in ETFO training to become an equity workshop presenter and got involved in writing projects to create equity resources and materials. I brought these resources back to the equity committee at my school, and together we are creating many resources – including picture books and teacher resources – that deal with equity issues. Our school library has a rich collection of equity-related books. Guest speakers from various ethnic backgrounds have visited our school assemblies. Diverse cultural art projects have become part of our everyday teaching. As a school, we take part in community events such as the Antiracism Day organized by the York Region Police Department. Our school organizes special events during African Heritage Month and South Asian Month. They are a ﬁrst step towards greater inclusiveness. Our equity committee is now creating resources that incorporate equity issues into the board’s Character Matters program to enable teachers to provide an equitable approach to this focus. All these initiatives were acknowledged by our school board, which honoured our school with an Antiracism and Ethnocultural Equity Education Award. I see a difference in the quality of work produced by students when an activity is based on their personal background and experiences. When students in my grade 2 class presented their cultural heritage projects, the effort they took and the detail they provided were immense. In my daily read-alouds, I consciously choose a book that helps students deal with prejudice or helps them ﬁnd a personal connection to a story. Their writing responses are very powerful. The equity training provided by ETFO has enabled me to understand my own biases and areas of ignorance. It has been an important tool in helping me to work with my colleagues to improve our students’ learning experiences. 1 R.G. Tharp, P. Estrada, S. Stoll Dalton, and L. A. Yamauchi. Transformed: Achieving Excellence, Fairness, Inclusion and Harmony. Boulder, CO: Westview Press, 2000. Deb St. Amant holds the distinction of being the first equity chairperson for the Kawartha Pine Ridge local. When they formed the committee earlier this year, the other members and local president Mark Fallis thought that with her experience in equity issues she would be the most suitable chair.